Is there anything better than roast chicken? I make it all the time but haven’t posted about it because it seems so boring. That said, it’s one of those dishes for which there are a million different recipes (high heat, low heat, fast, slow, combination, covered, uncovered, baste, no-baste etc.) and I’m pretty sure I’ve found the perfect one. Strangely it’s in Marcella Hazan’s Essentials of Classical Italian Cooking, a cookbook that really is essential, but this recipe doesn’t appear to be Italian at all. My copy opens right up to it. It’s very simple: you take a good 3-pound chicken (preferably Murray’s or Bell & Evans if you live in the US; those of you in the UK probably have many more options), wash it inside and out, pat it dry, and rub inside and out with kosher salt and fresh-ground pepper. Then take 2 small lemons, wash them and roll them on the counter to loosen them up, puncture them each in at least 20 places, place them inside the chicken and truss it up closely (but not tightly). Place breast down in a 350-degree oven for 30 minutes. Then turn it over carefully and cook for another 30-35 minutes; raise the heat to 400 and cook for another 20 minutes. 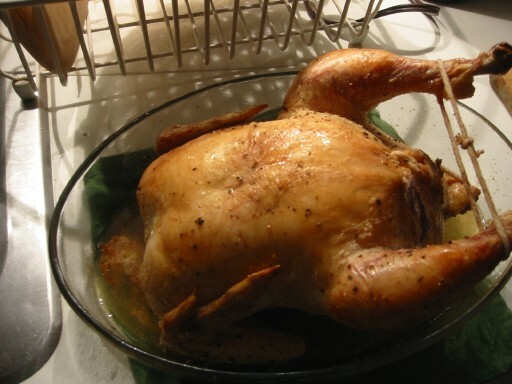 This bird is self-basting – no need to do anything else. Remove and serve. Have you ever tried Thomas Keller’s recipe for what he, somewhat pretentiously, calls mon poulet roti? It is my favorite roast chicken. Wow, super-simple. I’ll give it a try. Thanks. I really wish you hadn’t amended the title of the post, it made me laugh. Fiona, you have a sense o’ humour…. that said, there was no correction posted. Next time 9000 cracks one at my expense and I remain stony faced, I’ll remember you said that. I could have sworn you mistyped chicken. The thought of it’s making me laugh now. Even if you didn’t do it. @ 9000: prescient as ever.